CGEAR’s Sandlite Beach Mat is the only product made with patented technology to offer a truly sand-free experience. Here’s how it works: We stagger layers of precisely engineered polyester to form a type of conveyor belt. Each layer is designed to allow particles of sand, dirt, and dust to fall through the fabric rather than sit on its surface. Because the layers are staggered, sand can only go one way (down), not back up. And because we use only high quality polyester, sand doesn’t stick to the material. It falls through naturally and is quickly removed with the swipe of a hand. Best of all? Our lightweight and ultra-thin weaves are soft to the touch. A sand free life is the dream of every beach goer, but the Sandlite series is suited to a range of interests. It’s great for stretching, exercising, and doing yoga outdoors. 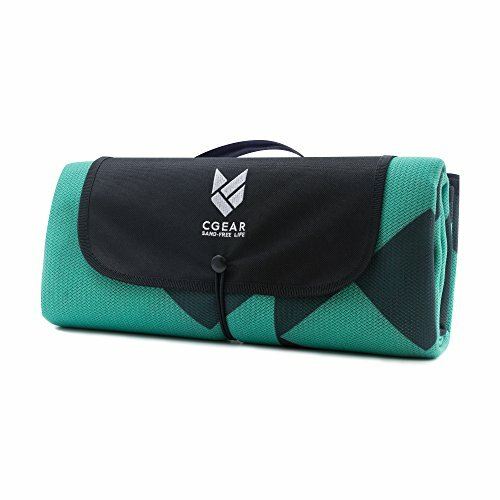 It makes a wonderful picnic blanket and is ideal for camping, backpacking, or going to a concert. Many people use our mats to protect important equipment in wet and sandy conditions. The SMALL (3’4” x 6’6”) Sandlite mat provides plenty of room for a single person. The MEDIUM (5’1” x 6’6”) sized mat accommodates two people comfortably. The LARGE (6’6” x 6’6”) mat was designed with families in mind, with space for four people. All our mats roll up into a compact package for easy transportation. They feature a convenient carrying handle as well as an elastic closure loop, which keeps them rolled tightly and securely. Sand-Free Life in Sand-Filled Paradise - CGEAR's Sandlite series features quality construction and the only patented sand-free technology on the market to offer versatile, cutting-edge comfort. Patented Two-Layer System - Sandlite's secret is a precisely engineered system of polyester layers that allow sand, dirt, and dust to fall through the fabric without being able to come back up. Perfect For Everything Outdoors - In addition to sunning on the beach, Sandlite mats are great for stretching and exercising, picnicking, camping, backpacking, and protecting important equipment. Durable For Repeated Use - CGEAR technology was originally developed for the military, and though our products see more vacations than battlefields, they're still made to withstand a lifetime of rugged use. Sized To Your Needs - SMALL offers plenty of room for one person. MEDIUM is great for couples. LARGE accommodates up to four people. All mats roll to a compact size and feature a carrying handle.